What, you thought Hillary Clinton was some kind of quitter? After having laid quiet for the past three weeks since Donald Trump “won” the presidential election in rather obviously illegitimate fashion, she’s now back in the game. She allowed third party candidate Jill Stein to be the one to file for recounts in the three seemingly rigged states, and only quietly signed on after the fact. But now that Trump is has gone into a conspiracy laden meltdown about the recounts, Hillary has begun actively seeking volunteers to help her win the Wisconsin recount. In hindsight, perhaps none of this should have come as a surprise. 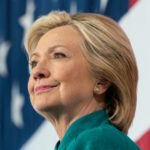 If Hillary Clinton had begun crying foul on election night, before she had any evidence of what many of instinctively knew could not be legitimate vote totals in states such as Michigan, Wisconsin, and Pennsylvania, the people in the middle would have laughed her off the stage. Major media outlets would have branded her a sore loser. And even if she had later been able to produce proof that the election was stolen from her, it would have been difficult to reverse the public sentiment that she didn’t like that she lost. So instead she stepped back and allowed public sentiment to come to her. It’s allowed her to initially take the position of only getting on board with the recounts because they were happening anyway and she wanted to make sure they were fair. It set up Donald Trump to be the first one to cry foul, as he reacted immaturely to the recount effort, making him the one who now appears unreasonable in the eyes of those in the middle. Two days ago, Hillary Clinton’s campaign took what seemed to be the first salvo in pushing back against Donald Trump’s recount tantrum, as her Deputy Communications Director lashed out at him as being “small and sad” for pushing so much dishonest propaganda. And now Hillary is asking her own supporters to sign up directly with her to help with the Wisconsin recount, no longer even bothering to steer them through Jill Stein. Because Hillary played it cool in the beginning and allowed the evidence and sentiment to build, she can be aggressive now without anyone being able to accuse her of simply not liking the result.